I dunno. Before the whole retcon of A3 being a 13er, SG Alpha Trion seemed like he was the genuine Alpha Trion of the Shattered Glass world, as he had some very Alpha Trion-like qualities, such as his being able to control the Shattered Glass version of Vector Sigma, Omega Terminus. we could also look at SG Alpha Trion as a future version of Alpha Trion where he has become corruptted as The Fallen or carrying out some unknown order from Primus. Well, think about this. Being a Mult Sing, while there would one Alpha Trion in a spiritual sense, he exists in multiple places all at the same time. One Alpha Trion isn't older than another, because they're all the same guy at the same exact moments in time. If one physical self were to be killed, the others wouldn't die because the single individual exists on a higher plane than that of ordinary beings. To me, what you're suggesting sounds like SG A3 could be easily killed if one of his "younger" selves were killed, which wouldn't be the case since the SG universe isn't any older than any other world, and SG A3 (now being a Mult Sing) is the same age as his other physical counterparts. SG A3 is still evil when he's in he TransTech universe, and he was there a long time. on a slightly different note, do any of you guys know where i can get my hands on the last 2 componants of nexus prime? i have breakaway, landquake and heatwave but i cant for the life of me get my hands on the other 2.
on that note, i would have expected at least 1 componant of nexus to be a member of the constructicon maximus molds seeing as he is the guardian of energon. I think that's a great way to handle his situation. Him being a false doppelganger would be a very good way to look at him. lioconvoy wrote: on a slightly different note, do any of you guys know where i can get my hands on the last 2 componants of nexus prime? Unfortunately, those two are sold out at the Club store. Your best bet would be to search online or hope to find them in the dealer room at a convention like BotCon, TFCon, or (on your side of the pond) Auto Assembly. lioconvoy wrote: on that note, i would have expected at least 1 componant of nexus to be a member of the constructicon maximus molds seeing as he is the guardian of energon. Erm, I don't follow. What's the connection between the Constructicons and guarding energon? Yes, you can join from outside North America, but it costs more to join via the International membership. what site can i go to in order to apply for tfcc? Well, Nexus doesn't dig for it. 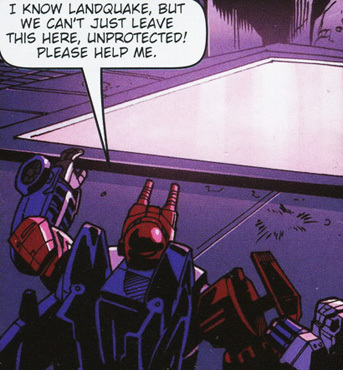 The Rarefied Energon that he guards is already in pools hidden away somewhere. lioconvoy wrote: what site can i go to in order to apply for tfcc?